The suitcases are made of lightweight yet durable 600 Jacquard Polyester. 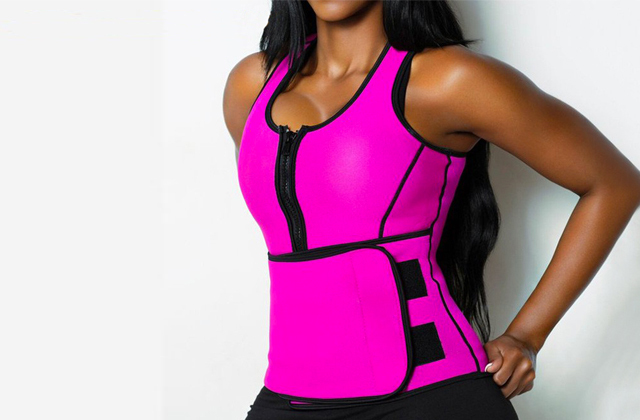 The material is hard-wearing and rip-resistant. The padlocks are lacking in quality. This set of three Aerolite suitcases will be the best choice for large families who like to travel light. The smallest suitcase is approved by most airlines for transportation as carry-on luggage. The set is available in 2 colours. These uprights have a very smart interior. It features packing straps and an internal zipped divider with elasticated pockets that are perfect for shoes. The capacity isn't enough for long trips. These hard shell suitcases are ideal for romantic weekend getaways or short business trips. The uprights have the IATA endorsed size and are approved for the vast majority of airlines around the globe. Having the IATA endorsed size, these carry-on trolley bags have a 42-litre capacity, which is much more than other carry-ons offer. They have only two wheels. The 5 Cities company offers you a cheap luggage set without extra frills. Each carry-on trolley bag weighs less than 1.5 kg and has an incredible 42 L volume, which makes the set a worthy choice for overpackers. The medium and large suitcases have side feet that make them more stable when they're on the side. In reality, the colours are not that bright. The VonHaus 3-piece set is an ideal option for serious family trips. 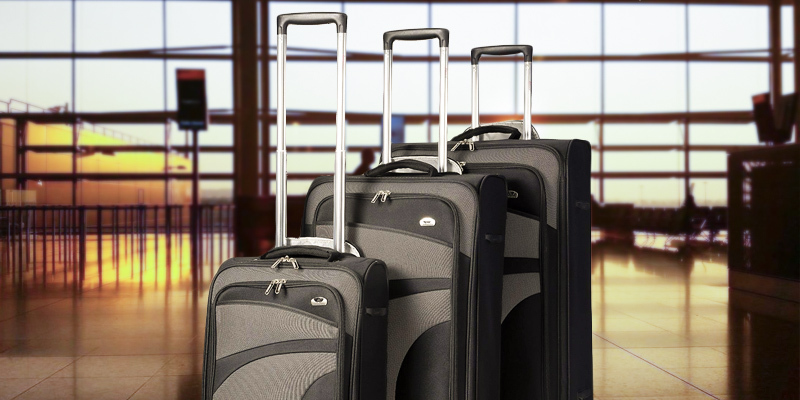 Three spinner suitcases are made of rigid ABS plastic and are strong enough to withstand the harshest travel elements. The suitcases are made of alloy-effect anti-scratch ABS plastic material that is highly resistant to scuffs. 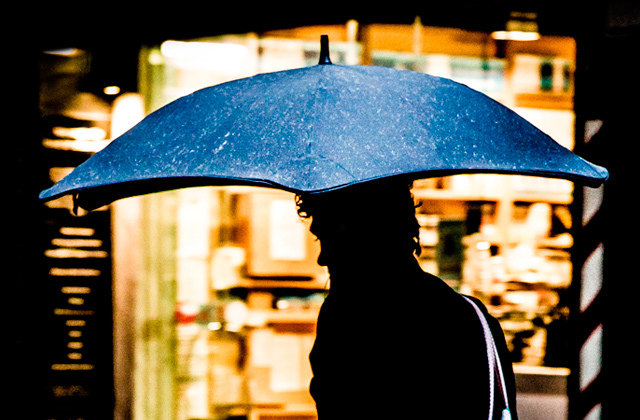 Plus, they are showerproof and offer some protection from light rain. No side handles for easy lifting. The Cabin Max Toronto luggage set is ultra-comfortable and ultra-durable. Made of the premium materials, it will definitely stand the test of time and look like brand new after numerous trips. Aerolite helps travellers worldwide to beat weight restrictions with their super-lightweight luggage, and this set is no exception. Each soft shell suitcase is made of lightweight and rip-stop 600 Jacquard polyester. Even the largest case in this set weighs less than 3 kilos, meaning this luggage is great for those families who prefer travel light. 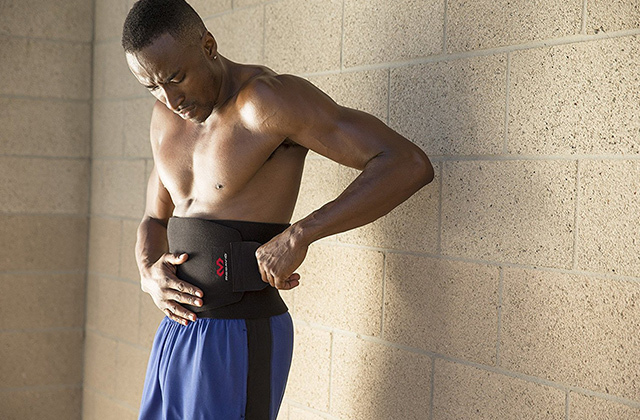 Though the material isn't as rigid as ABS plastic or polypropylene, it's still very hard-wearing and durable. 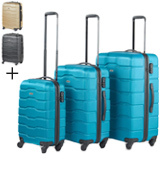 The set includes a 21" cabin suitcase, 26" medium suitcase, and 29" large suitcase. If you want, you can get each of these bags separately or combine a set of two (Cabin+Medium, Cabin+Large, Madium+Large). 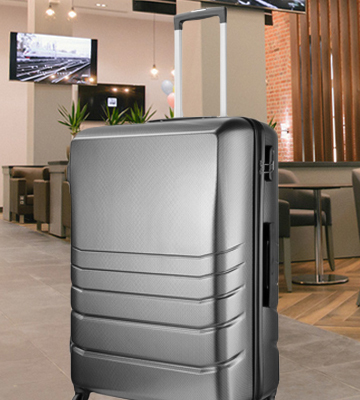 Equipped with four 360-degree spinner wheels and a double-tube retractable handles, the cases are very comfortable to navigate through the airport. 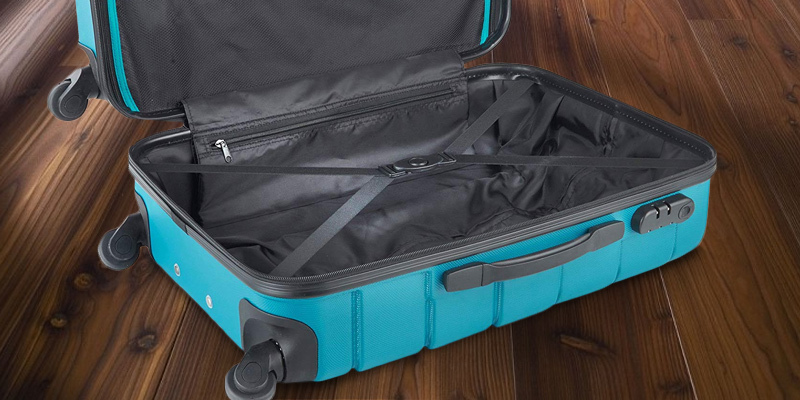 For easy lifting, the suitcases feature top and side handles. Each bag has multiple interior compartments for neat organization of all your stuff and two large zippered exterior pockets. The manufacturer supplies 3-digit combination padlocks for added security. Though locks are lacking in quality a little, they can do a great job at discouraging potential thieves. 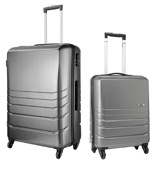 Other than that, these Aerolite suitcases are ideal for light travellers. This Aerolite set is an excellent choice for couples who often spend their lovely weekends far away from home. It consists of two hard shell cabin suitcases that are very classy looking. Produced from robust ABS material, they have a ribbed shell exterior that can make any potential scuffs less visible. The bags seem to be well-built and strong enough to endure numerous trips. But the main selling point of this set is that the cases can go into the aircraft cabin. Each suitcase measures just 55 x 35 x 20 cm and is accepted as carry-on luggage by a wide variety of global airlines including Ryanair, EasyJet, British Airways, Vueling, Virgin Atlantic, Flybe, Norwegian, Aegean, Turkish Airlines, Aeroflot, Lufthansa, Wizz Air, Air Berlin, Aer Lingus, Air France, Air Europa, TUI, American Airlines, Finnair, Delta, Emirates, Iberia, KLM, Thomas Cook and more. Even if the required airline wasn't listed, the suitcases might be approved for it. Just check this online. 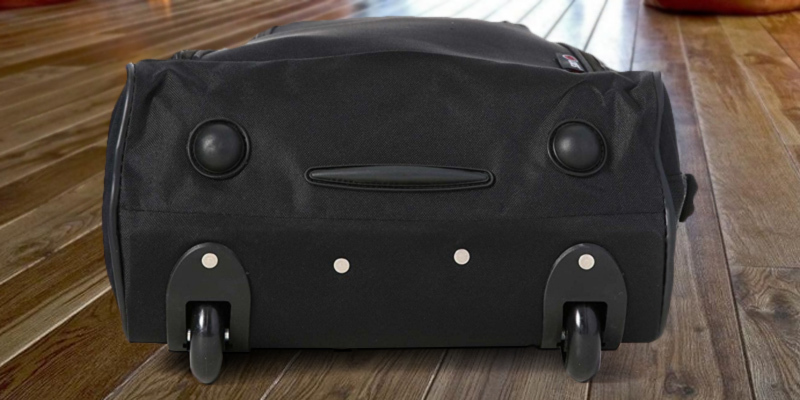 The suitcases weigh just 2.5 kg each and offer 33 L of inner capacity. The interior features handy packing cross straps and a zipped divider with mesh pockets. 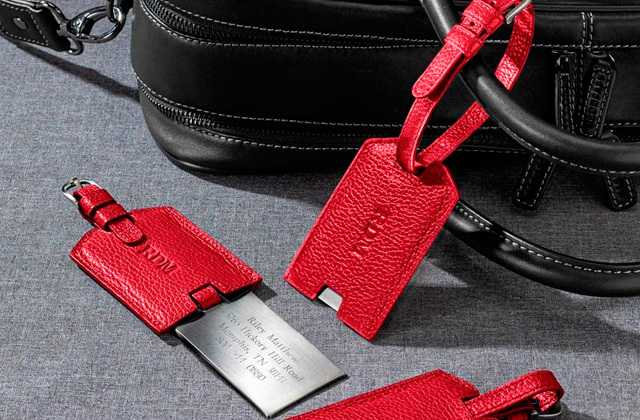 To secure your belongings from unwanted hands, you can use the 3-digit combination barrel padlocks that are already included in the set. Although these cases don't have enough room for a week's worth of clothing, they are good for weekend getaways or short business trips. 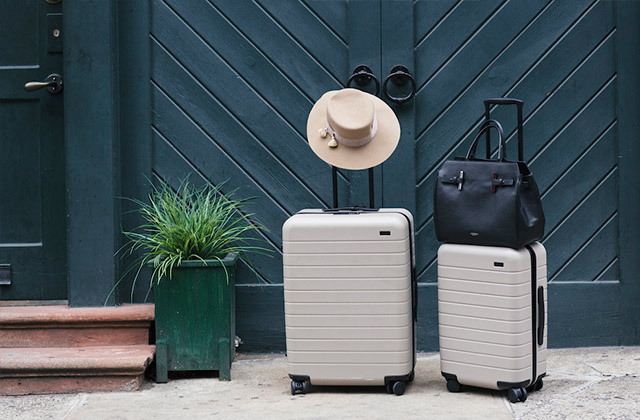 If you're looking for cheap no-frills cabin luggage, these 5 Cities bags from the Valencia collection might be the best bet. The manufacturer has decided to forego costly ABS plastic coating and made these bags of Polyester. So, what you receive are fairly good abrasion resistance and extra lightness. Speaking of the latter, each of these trolley bags offers up to 42 L of volume while weighing less than 1.5 kg. 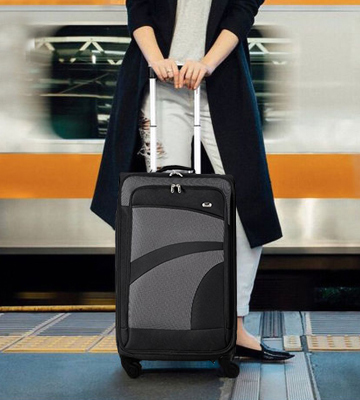 Aside from this, you will get other usual benefits of lightweight luggage such as a retractable telescopic handle and a couple of wheels with protective rubber ball skids at the base. Take note that each trolley has only two wheels and they aren't 360-degree rotatable, meaning you'll have to tilt it rather than steering upright. Though, you will definitely appreciate a carry handle on the side and a tug handle on the top. It's also worth mentioning that the bags might not stand upright if packed full. The one thing that can help them stand better on their own is fully-packed corners. These lightweight trolley bags come in a variety of colours and patterns to make your journeys more personalized. 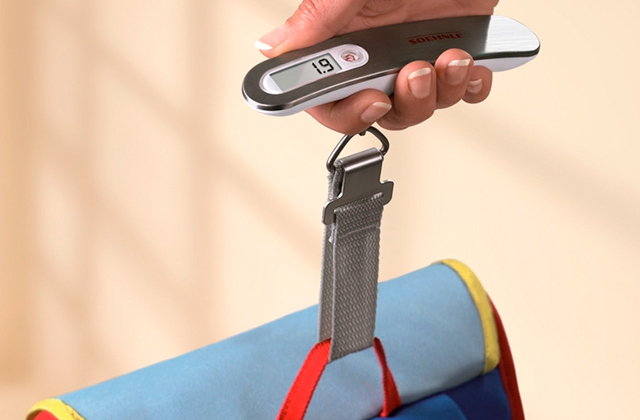 All of them measure 55x35x20 cm and are approved for the majority of airlines around the globe. 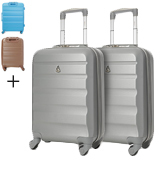 So, if you want an attractive lightweight 2-piece luggage set that won't break the bank, this one is a sensible option. Looking for the set that can handle the harshest knocks, bumps, and lots of throwing? Meet this set from VonHaus that is manufactured from hard-wearing ABS hard material. 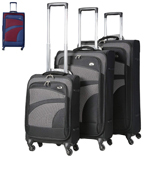 The set includes three suitcases of different sizes: small, medium, and large. The smallest case is designed for carry-on luggage and can fit in the overhead compartment. Each of three trolley suitcases has a telescoping handle and four multi-directional wheels for easy handling and good manoeuvrability. 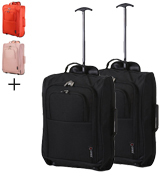 In addition, the suitcases have top and side carry handles with an ergonomic grip. And as a nice design touch, medium and large suitcases have side feet which make them more stable when they're on the side. 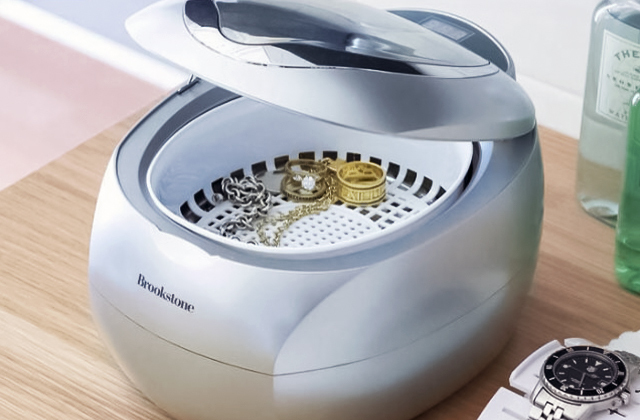 These spinners not only have hard shell coating but also they are fully lined inside to be maximum safe for fragile items and souvenirs. The top inner compartment has a clip-in divider with a mesh pocket for easily-mislaid items, while the bottom one has two packing straps to keep your stuff in place. Take note that none of the suitcases can be expanded to give you extra packing flexibility. To secure your belongings, you can set a TSA combination lock that blocks a zipper. Safe, sturdy, and capacious, these are the perfect hard-shell cases for serious family trips. The Toronto luggage set of 2 pcs has a sleek and timeless design to suit either business trips or pleasure jaunts. The alloy-effect anti-scratch ABS outer casing is extremely light yet it guarantees outstanding impact performance. 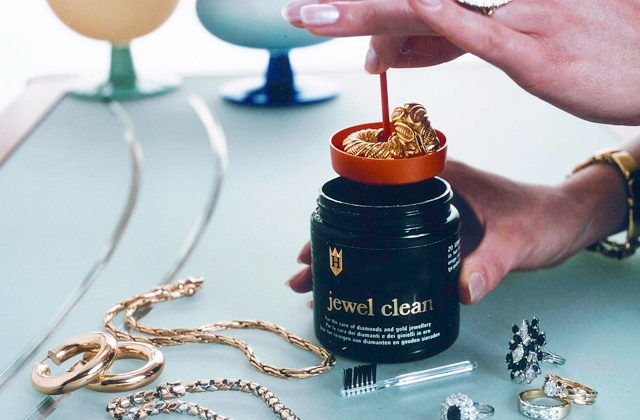 It boasts high energy-absorption qualities and is ideal for keeping the contents secure whilst on the move. Moreover, the ABS shell makes the suitcases showerproof, meaning they will protect the belongings during light rain showers for some period of time. The cabin case measures 55x40x20 cm and weighs 2.9 kg. It has generous 40-litre volume with cross straps on one side and a divider panel on the other. Travel essentials and documents can be stored in 3 internal zipped pockets. Both cases can be locked with the external TSA combination lock for stress-free travels. The locks are very simple to use - you just need to place the zips in the lock slots and scramble the preferable combination. No worries about losing padlock keys. 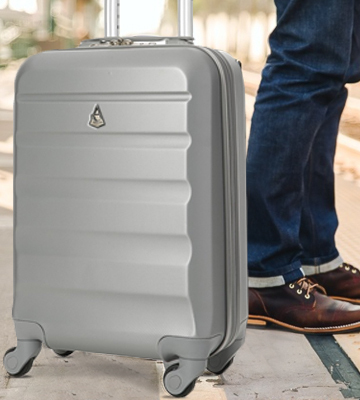 The Toronto suitcases have multi-directional spinner wheels and an aluminium telescopic handle for easy navigation through crowded places. 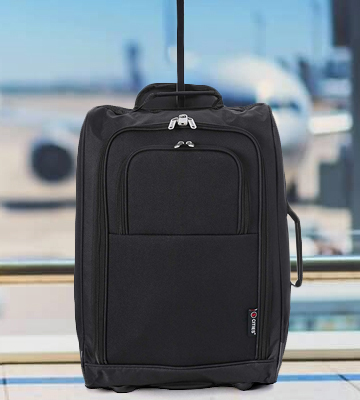 Overall, if you need an ultra-durable and ultra-comfortable luggage that will look like new after numerous trips, try the Cabin Max Toronto hard-sided cases. Going on a long international travel? Flying somewhere? Planning a short weekend jaunt? Wherever you are heading, you need to pack your belongings wisely, and a quality luggage set will do the trick. 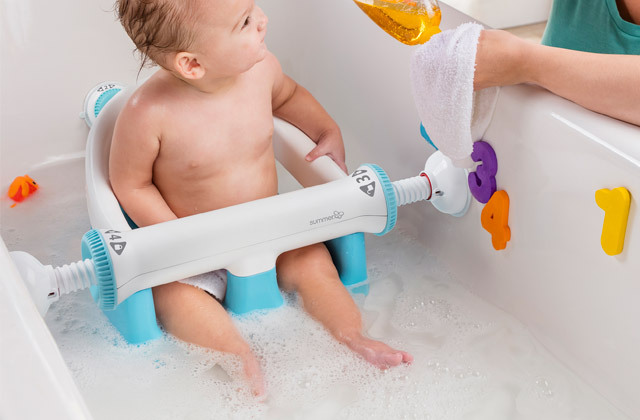 The set usually consists of two or more units of different shapes and sizes for the transportation of clothes, toiletries, books, and other necessities. The set can help you organize all your stuff neatly and keep your essentials right at your fingertips. Luggage sets are usually attractive and trendy, so you can quickly find your bags among other baggage at the airport. 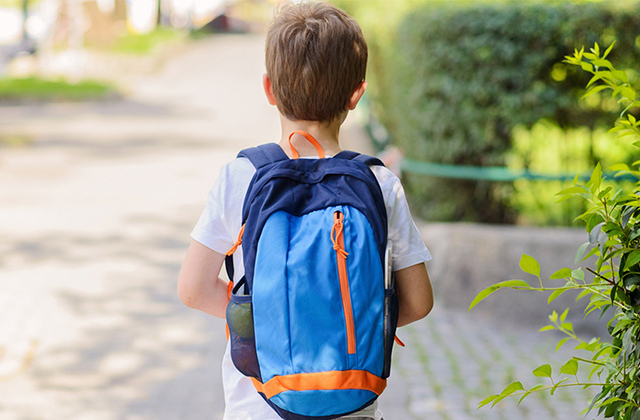 The set is a good investment for large families as well; the biggest pieces are perfect for parents, while the smaller bags can go to the children. For this survey, we have selected only the best luggage sets to simplify your choice a bit. To make your travels more comfortable, we recommend you to get a travel pillow and a sleep mask. 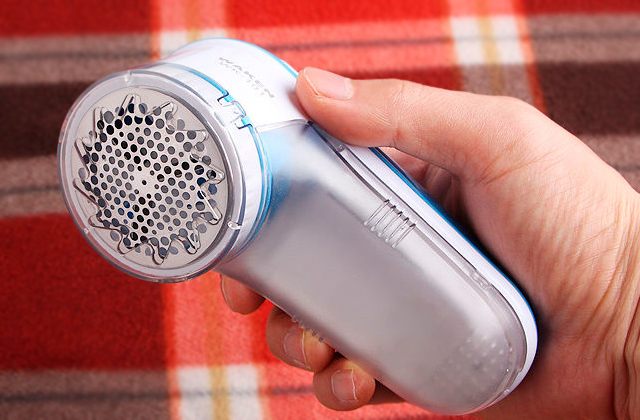 Other useful things during a long journey are a power bank and an MP3 player. 1. How to choose the perfect suitcase, FOX News. January 15, 2013. 2. Julie Loffredi How to Pick the Perfect Luggage, U.S. News & World Report. September 14, 2015. 3. 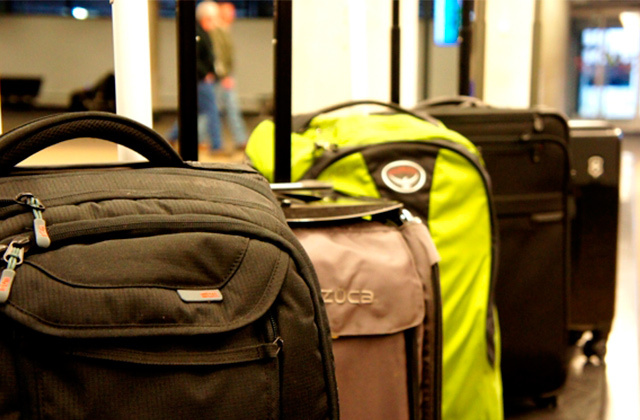 Martha Ostergar How to Choose Luggage Sizes When Flying, Overstock. November 7, 2016. 4. 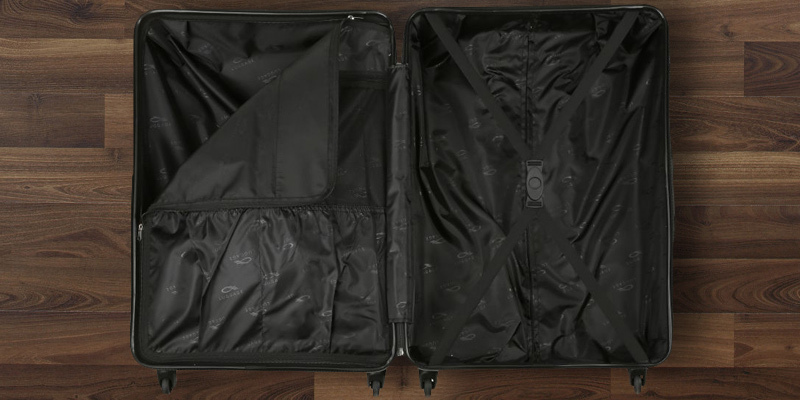 Melanie Pinola The Best Way to Pack a Suitcase: Five Methods Compared, Lifehacker. November 9, 2015. 5. 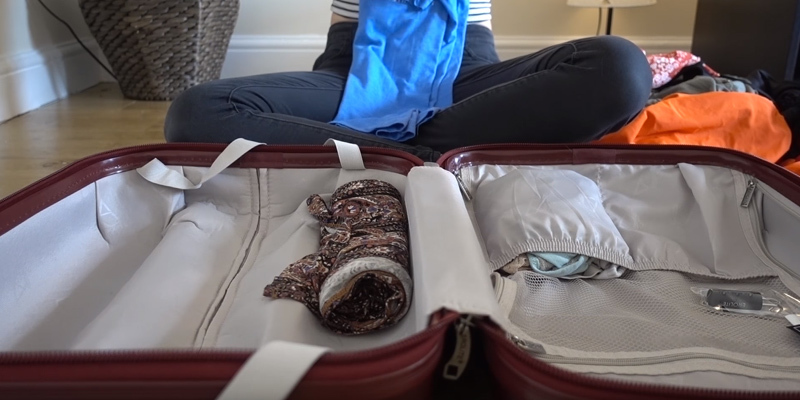 Caroline Costello 10 packing tips every traveler should know, USA TODAY.